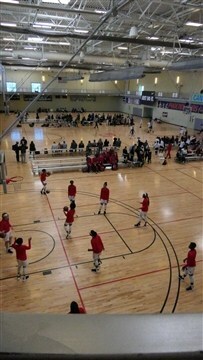 Picture yourself playing in North America’s largest high school basketball tournament. University and college scouts are everywhere. It is Day 4 and you are on the floor. KES is down by one point in the second overtime period. There are four seconds left on the clock and you have the ball. A blatant foul sends you to the free throw line. Two shots: sink them both and we win. Miss them both and we lose. Sink one and we tie, forcing a third overtime period. 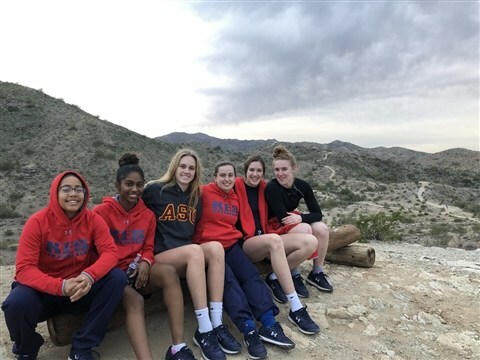 It is the stuff of sports fantasy, and yet, this is the exact situation Aaliyah Arab-Smith (Grade 11) and our KES Girls’ Prep Basketball Team found themselves in on December 22nd at the Nike Tournament of Champions in Phoenix, Arizona. Aaliyah took to the line and the referee tossed her the ball. Both benches and every spectator held their breath as Aaliyah took her first shot. After circling the rim, the ball bounced out. Cheers erupted from the opposition stands. The rest of us, hearts beating wildly, watched as Aaliyah prepared herself for her second shot. Down by one: sink the ball and we go to overtime. Miss it and the game is lost. With practised ease, Aaliyah bounced the ball a few times and then deftly launched it towards the basket. Swish! Everyone leapt to their feet cheering. What a shot to make under that kind of pressure! I love moments like this. They are transformational. For sports to have educational value, they must act like metaphors – offering us safe opportunities to perform as individuals and as a team in search of a goal. We learn about ourselves and how to communicate and act with others. We learn to adapt and to react to the moment. With good coaching and mentoring, the lessons we learn in sports transcend the athletic arena and play out in real life. We become better people, not just better athletes. We did not score as many points as our opponents in the final overtime period, but the girls emerged champions nonetheless (in my heart at least!). Happy 2019 everyone. May it bring you thrilling moments of joy.